When Squeeze released their greatest hits compilation in 1982, it was titled Singles - 45s and Under. Reading like a classified ad in the local paper it did, of course, cleverly reference the typical playing speed of a 7" single (45 rpm, kids). Thirty years later and Squeeze have, pretty much, kept it going with comparatively little time out. Mainstays Chris Difford and Glen Tilbrook continue to be the band's axis, while still pursuing solo or side projects, and part-timers Jools Holland and Paul Carrack have long since moved on to pastures new. 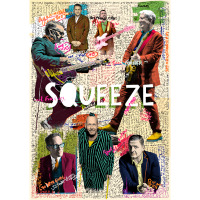 Squeeze's living legacy is a canon of incredibly catchy soulful pop songs of the highest calibre, from the quirky novelty of Cool For Cats to the gin and regret of Labelled With Love and the kitchen sink drama of Up The Junction. It is a collection of songs like no other and Tilbrook, Difford and co continue to deliver them with unflinching, ageless quality. The same can probably not be said for their fans. All those 45s-and-under from the early eighties are, for the most part, likely to be past that particular milestone and probably married, with kids of their own. The wonderful thing about Squeeze is that a new generation will always warm to songs like Tempted and Pulling Mussels, irrespective of age (of song or listener). With another huge tour announced for autumn 2012, don't be surprised if a significant proportion of the crowd are 33 and 1/3 (and under). Squeeze kick off the Pop Up Shop tour in Guildford on 16th November, taking in 20 more venues before the final night at the IndigO2 on 14th December, following two prior London shows in Kentish Town and Shepherds Bush. We will have tickets for all dates available when they go on sale at 9am on Friday 30th March, priced £37.50 for the London gigs and £32.50 for all other dates. There are also a handful of summer festival slots lined up - see below for tickets/info.